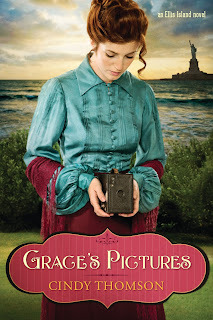 Thanks to the Tyndale Blog Network, I was able to participate in the blog tour for Cindy Thomson's book, Grace's Pictures. Grace McCaffery hopes that the bustling streets of New York hold all the promise that the lush hills of Ireland did not. As her efforts to earn enough money to bring her mother to America fail, she wonders if her new Brownie camera could be the answer. But a casual stroll through a beautiful New York City park turns into a hostile run-in with local gangsters, who are convinced her camera holds the first and only photos of their elusive leader. A policeman with a personal commitment to help those less fortunate finds Grace attractive and longs to help her, but Grace believes such men cannot be trusted. Spread thin between her quest to rescue her mother, do well in a new nanny job, and avoid the gang intent on intimidating her, Grace must put her faith in unlikely sources to learn the true meaning of courage and forgiveness. I almost always enjoy stories of the immigrant/NYC -type, and this story by Cindy Thomson, a new author to me, was no exception. Newly-arrived Grace, from Ireland, must find her way in this new country, fighting her fears and beliefs that she is a failure. When she sees an opportunity to buy a $1 Brownie camera and prove that she is good at something, Grace inadvertently winds up in more trouble than she ever thought possible. Everyone has a camera nowadays and being an amateur photographer myself, I thought the story was unique and different from most immigrant stories, weaving in the history of photography and the ensuing issues of privacy. I thought Grace's Pictures was an enjoyable, light read. I liked Cindy's style and would read another book by her! AND FOR YOU, a Q&A with Cindy HERE and a peek into the book HERE. Thank you to Cindy and Tyndale for sending me a copy to read and review!